A refractive surgical procedure that employs a computer controlled excimer laser system to sculpt, by ablation of the central corneal zone, or visual axis. This procedure corrects mild to moderate cases of nearsightedness. Patients who are not candidates for LASIK may be candidates for PRK as less corneal tissue is removed during the treatment. With PRK, the visual recovery is slower and there may be more (initial) post-operative discomfort than that of LASIK. Also, the incidence of post-operative ocular dryness is reduced with PRK, making this an excellent procedure for those patients who suffer from dry eye syndrome. 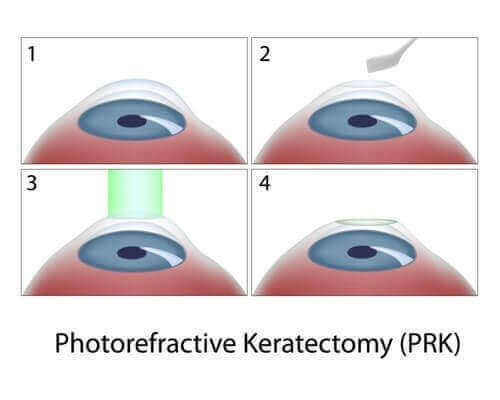 Custom PRK is a procedure that enables your laser vision correction surgeon to further customize the conventional PRK procedure to your individual eyes. Custom PRK provides an additional level of data about your vision requirements using wavefront technology. A device called a wavefront analyzer measures the way light travels through your eye and compares it to an eye with perfect vision. This device then creates a 3-D wavefront map that is uniquely yours, in the same way that your “fingerprint” is unique to only you. This additional data is then used by your surgeon to customize the PRK laser vision correction procedure to your individual vision requirements. The actual PRK procedure process is performed the same way in both conventional PRK and Custom PRK. Conventional PRK is an excellent choice for many patients. Your doctor will recommend which procedure is best for you based on your visual requirement; they will help you to determine if you could benefit from the higher level of customization that Custom PRK may provide. A refractive surgical procedure that is commonly used to treat patients with cataracts. The procedure has been modified to also correct nearsightedness in high prescription ranges and most ranges of farsightedness. During the lensectomy procedure, the natural lens (crystalline lens) is extracted and an artificial lens is implanted. The power of the artificial lens is determined preoperatively during the full eye examination. There is minimal discomfort and visual recovery is very rapid. Presbyopia is the age-related loss of the ability to focus up close to read. New implants developed for use after cataract surgery can to a large extent reverse these changes and allow independence from glasses after surgery. Three of these implants (IOLS) are now approved by the FDA. The crystalens IOL is the only accommodative IOL available in the U.S. that is designed to provide a continuous range of vision for distance, intermediate and near. Near and intermediate vision result from the action of the focusing muscle in the eye, called the ciliary muscle. This movement of the lens enables the eye to focus at distance, intermediate and near to reduce your need for glasses after surgery. Clinical research shows that 73% of people with the crystalens in both eyes never or only rarely wear glasses. The ReZoom is a multifocal IOL. That means that it provides multiple focal points so you can see well at a variety of distances. It allows most people to see well at near, intermediate and distance. The ReZoom Multifocal lens is divided into five different zones with each zone designed for different light and focal sources at night. A clinical study has shown that 93% of people with the ReZoom in both eyes never or only occasionally wear glasses. The ReSTOR IOL uses multifocal diffractive technology to give a full range of vision (near, intermediate and distance) that increases independence from glasses. Its unique design means that in bright light when the pupil is constricted incoming light is equally divided between near and distance vision for better reading, and when the pupil is enlarged as when driving at night, incoming light is focused almost entirely for distance. Multifocal IOLs do have the potential to produce halos around light sources at night. A clinical study has shown that 76% of people with the ReSTOR in both eyes never wear glasses. Medicare does not fund the additional cost of these newest types of implants and related services. However, Medicare patients are now allowed by Medicare to purchase these for an additional price so that they may enjoy the advantages of theses presbyopia correcting IOLs following cataract surgery. If you would like more information on these lenses, please call 1-800-494-2020 and we will send you further educational material.